The Myasishchev M-50 'Bounder' owes its birth to the B-58 Hustler. 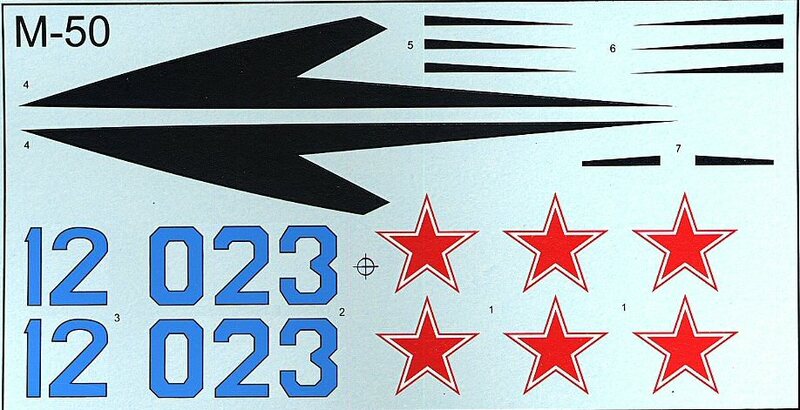 In the early 50's the Soviet Union became aware of the US plans for a supersonic jet bomber and naturally they had to counteract it with an equivalent design. Vladimir Myasishchev's work in concept exploration for future supersonic bombers established him and his bureau as an expert in the field. A new problem specific to this new type of mission wwas the ability to fly transcontinental and supersonic but still have low enough fuel consumption to make it to the US. I am not sure if the design would accommodate the return portion of the trip. The Hustler would not come back home after its mission either. Detailed studies were performed to achieve the optimum aerodynamic configuration and the new turbojet engines necessary. Numerous configurations were explored before Myasishchev could make a recommendation to the air force. The pressure was great on Myasishchev since the Council of Ministers wanted the first aircraft available for testing by the first quarter of 1958. 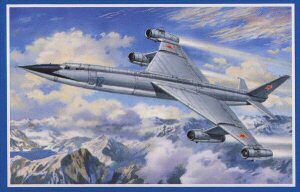 Eventually the Myasishchev bureau (OKB-23) chose the most promising configuration out of four concepts. Even so it was calculated that the proposed design would not meet speed or range requirements. Yet, the Soviet Union needed an answer to the US threat and the program moved on with a first official flight on 27 October 1959. 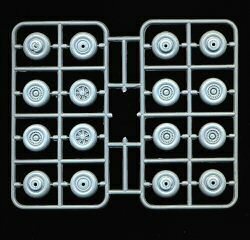 The M-50 was originally designed to be powered by four Zubets RD-16-17 engines of approximately 18,000 kg thrust each. Because the engines were not available on time, the M-50 was instead powered by lesser engines (2 after burning Dobrynin VD-7M designed for the Tu-22 Blinder and 2 non after burning VD-7G). It is not confirmed if the Bounder ever went supersonic. The Bounder made brief history on 9 July 1961when it flew over the Tushino airfield in Moscow sending the analysts back home with news and pictures about a new big and unorthodox bomber! Unfortunately the fate of this project was sealed. In December 1960, Nikita Khruschev gave a speech at the Supreme Soviet session and proclaimed that no further development of military aircraft would be necessary. Khruschev was fascinated with the triumphs of Russian technology in space and believed that all the tasks formerly executed by combat aircraft could now be performed by various guided missiles types. A joint decree terminated work on new aircraft. A total of 19 flights were performed by the Bounder before the program was canceled. The aircraft featured many unique and innovative solutions such as the use of automation to allow for a two-pilot crew not usual for large four engine bombers at that time. Also the Bounder featured a unique center of gravity management system that operated by moving fuel between tanks. The prototype was left neglected at the Zhukovskiy site until it was moved to the Air Force Museum at Monino where it can be seen today. Who else other than Amodel would tackle such an obscure and exotic subject! 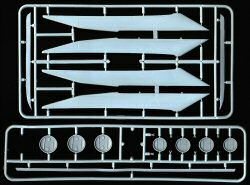 The kit still follows the familiar Amodel methods of casting the largest parts in fiberglass and the rest of the parts in injected plastic. 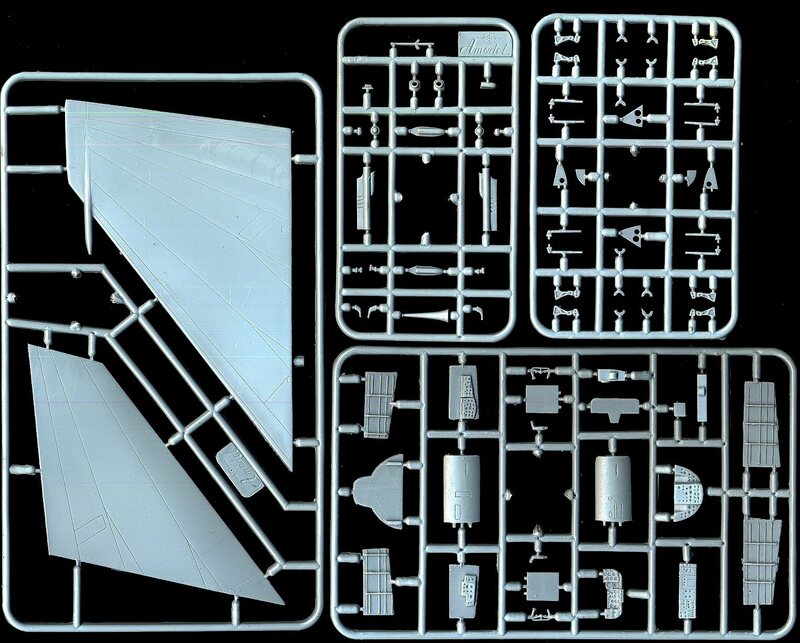 Except this time Amodel has impressed me with excellent fiberglass quality. 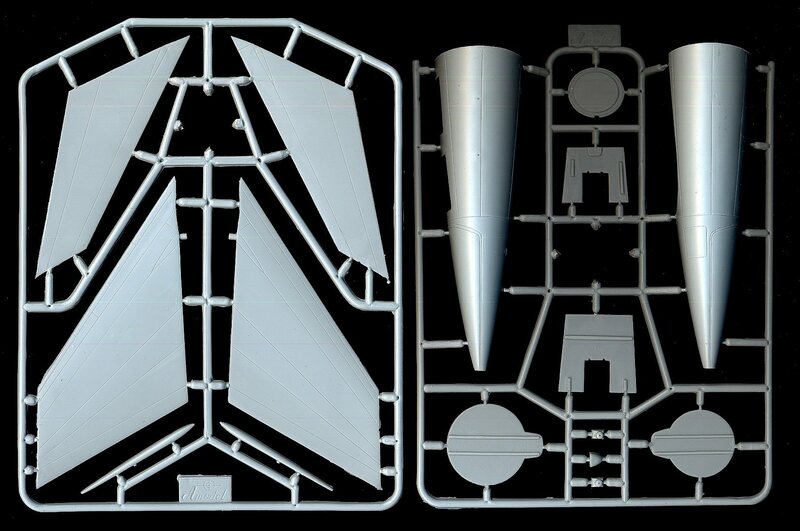 The surface of the wings and fuselage is shiny and practically free of defects. 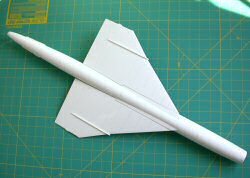 What a big surprise it was to see the wings readily fitting to the fuselage and making good joints off the bat! The fiberglass is white and maybe a bit smellier too. 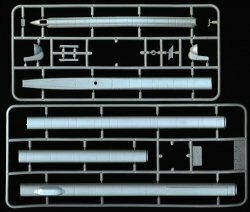 Construction of the kit starts with the cockpit and the front fuselage plug. 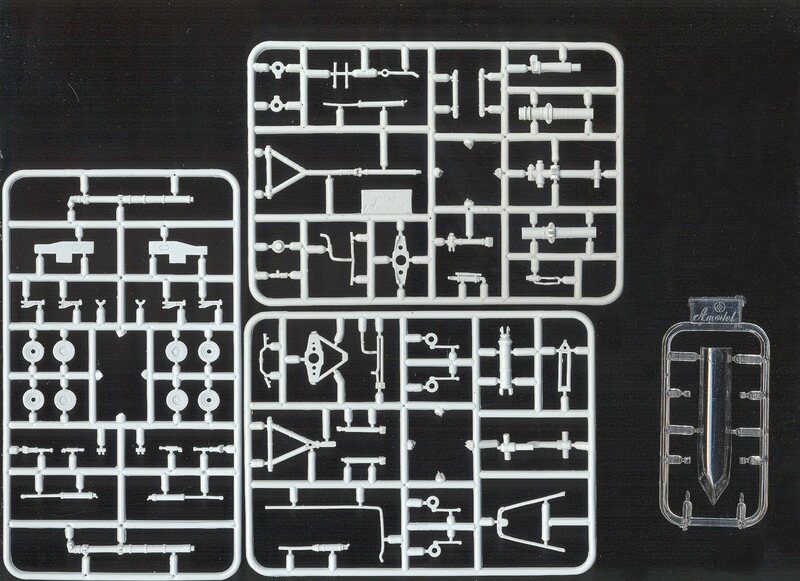 The two cockpits are well detailed for a 72nd scale kit and they come in 42 parts! I cannot say anything about the accuracy since I have never seen a picture of the Bounder's cockpit. It is of interest to note that the model can be posed with the ejection seats deployed in the downward under fuselage position since this is how the pilots ejected or got in and out of the Bounder. The spine on the top of the fuselage comes in five consecutive parts and attention will need to be exercised to align them properly since there are no locating pins present. 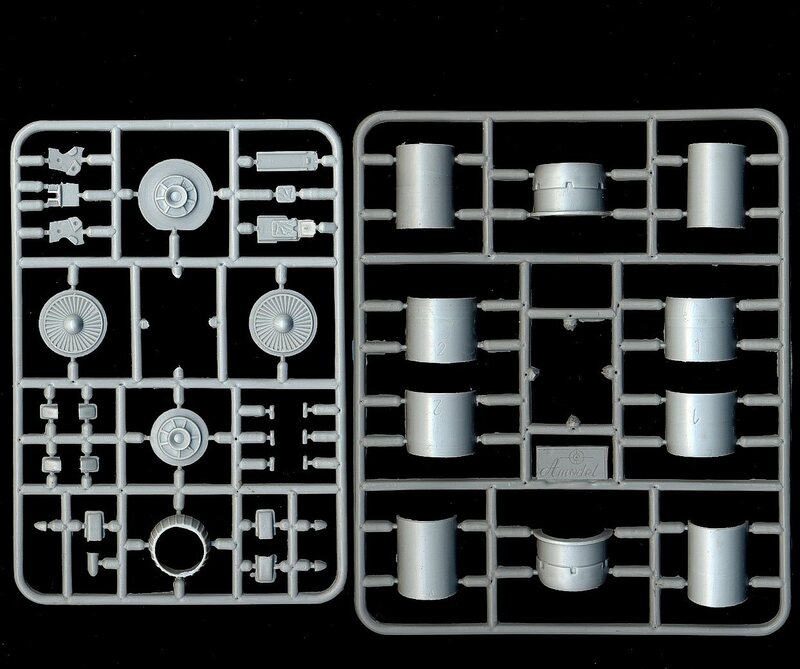 The landing gear and the wheel wells are amazing in detail much like the ones present in the Amodel Bison. There is one important difference though. 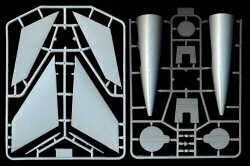 The wheel wells on the Bison are difficult to fit and adjust so they are at the right height and they make good contact with the fuselage cut out. 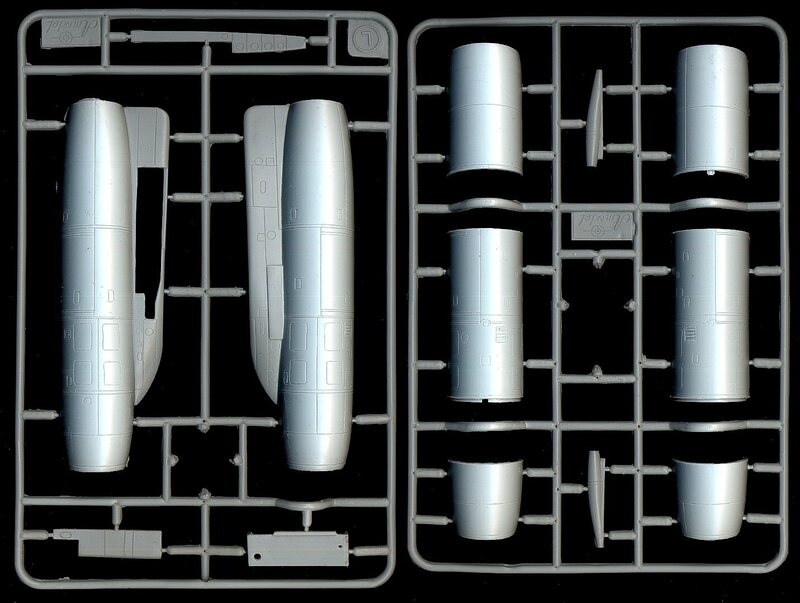 In the Bounder Amodel made some improvements. 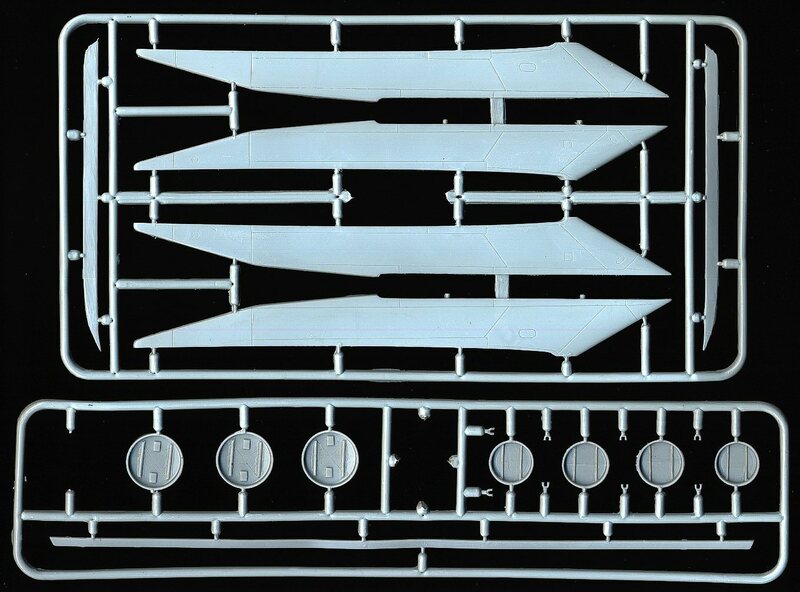 First of all they opened the cut outs themselves and the modeler does not have to saw out the blanking fiberglass to reveal the wheel wells. 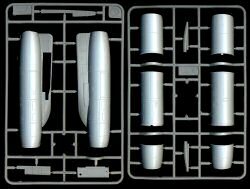 The other important thing is that the plastic wheel well walls contain a "lip" now that will integrate the wheel wells to the fuselage and provide a much cleaner look when completed. I wish they had though of that earlier and done the Bisons the same way. 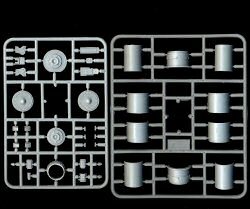 The engines are also complex and they come in about thirty pieces for the main after burning engines, including two different pylon designs. For the outboard non after burning engines we get fifteen parts per engine including the multitude of small and large air intake scoops. 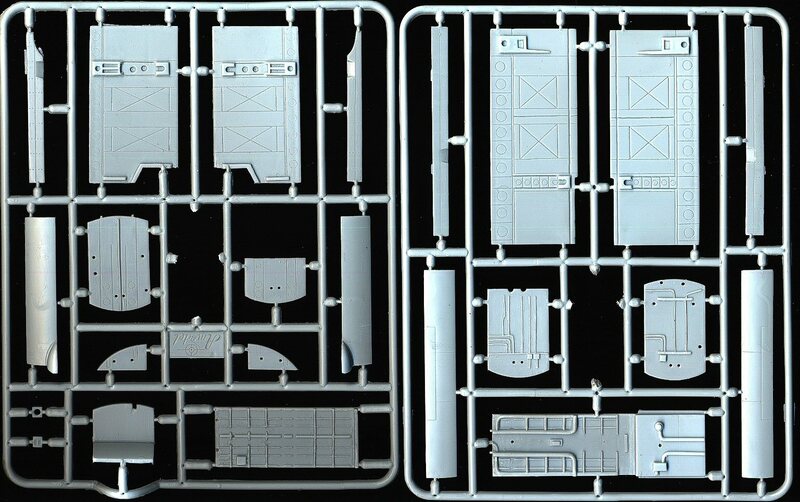 The clear parts are actually very transparent and will look great after a dip in Future. There are decals to cover four different periods in the Bounder's brief life. The early 023 as it looked in the very beginning of its test life and three versions of the blue 12 ranging from natural metal, to the gray top/ white bottom to the way it looks now at Monino. 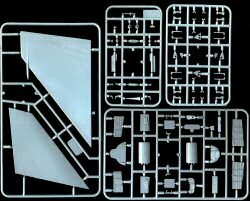 >This is going to be one special looking model in any body's Soviet Aircraft collection. 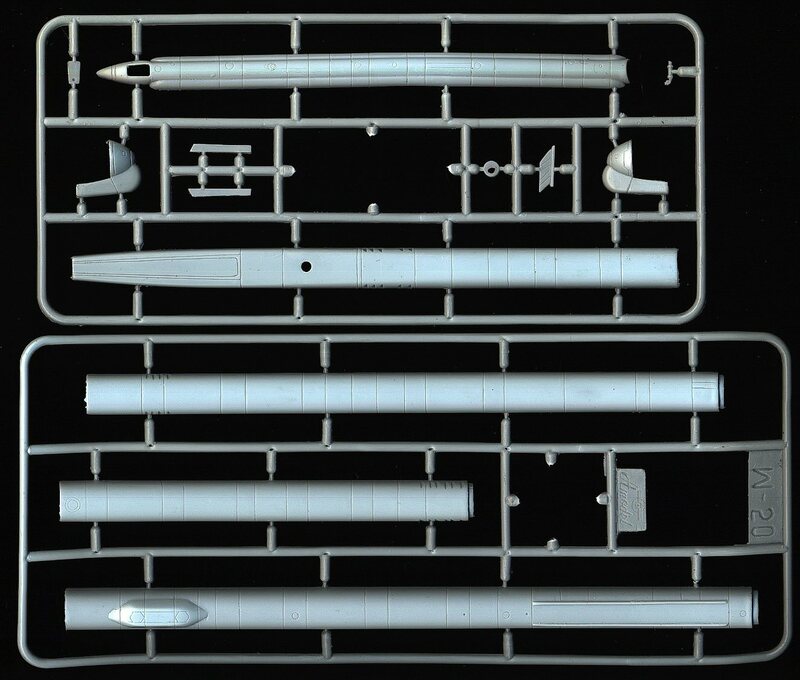 Amodel has made some great improvements in their fiberglass quality. 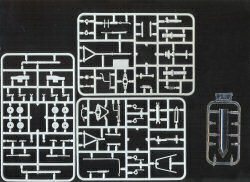 Their plastic is getting better too but there are still some areas that need improvement. 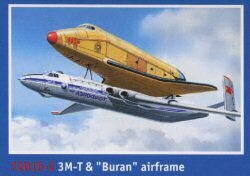 I hope Amodel continues releasing these great subjects and speaking of great subjects on the side of the box where they advertise the other kits in their lineup, I noticed a VM-T with the Buran on top! Now this is an exciting combination. 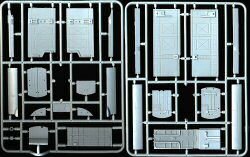 The kit is very much recommended to modelers with experience in limited run kits. 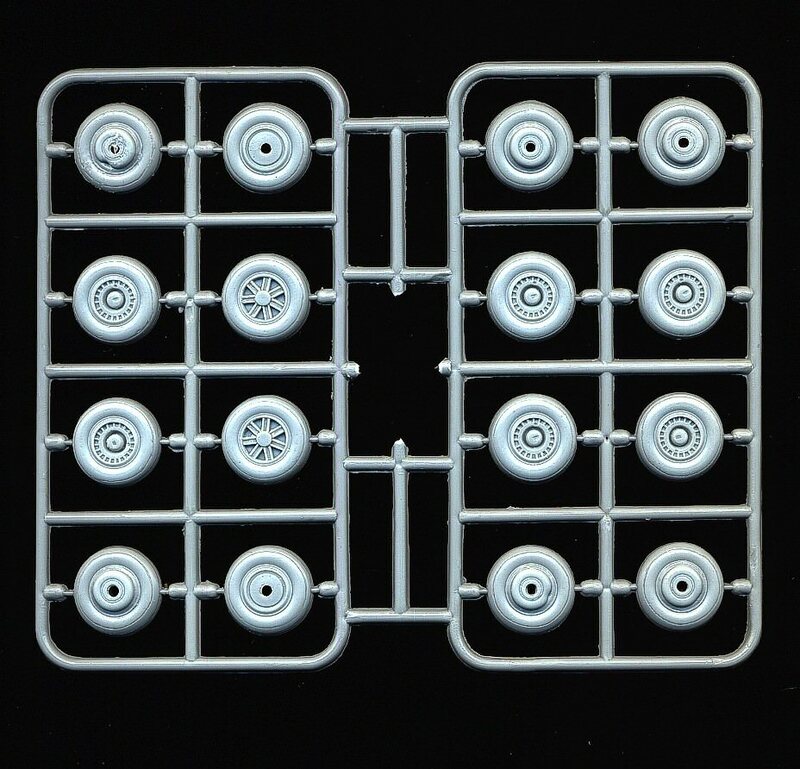 The kit was purchased from Guy Holroyd at Linden Hill Imports: Guy's prices are always unbeatable and are the lowest in the US for big Amodel kits.